The CADWAGO project held its second Governance Learning Workshop on Tuesday 24th June 2014 at Mary Sumner House in London, UK. The aim of the workshop was to engage in a co-inquiry, drawing on the perspectives of all participants to consider themes of mutual interest arising across Europe in the context of water policy and governance under conditions of climate change. Around 30 people participated in the workshop including academics, consultants, environmental NGOs, and people working for the UK government. A full report is available here: ‘Governance learning workshop report London 2014’. 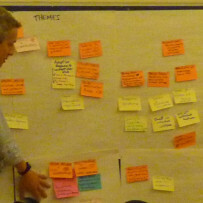 The workshop was designed around the on-going Cadwago UK case study concerned with the evolution of a catchment-based approach to water governance. The one-day workshop comprised sessions to actively engage participants in systems thinking, modelling, negotiating and evaluating in order to explore water governance, formulate problems and opportunities, identify feasible and desirable changes, and take informed actions. planning under conditions of uncertainty. Participants worked together to identify issues and opportunities for change in relation to these themes. The most important issues and opportunities were taken forward in a discussion about ‘systems of interest’ and what concerted actions are needed to improve water governance. An example of a system of interest was to institutionalise opportunities [social capital] arising from water crises. The associated actions related to a more pro-active, collaborative approach to water governance which takes into account the many different types of knowledge and experiences of those involved. The workshop generally proved successful for this group of stakeholders as it engaged them in dialogue and in working together using skills and techniques in systems thinking, leading to new insights and shared understandings about water governance, and concerted actions to improve it. The workshop has also raised wider questions about enabling — on a local, national and global scale — the new and different ways of thinking and acting that are necessary to meet the future challenges of climate change adaptation and water governance. The on-going work of the CADWAGO project provides an opportunity to begin to address some of these questions.